DD Form 455 or the "Report Of Proceedings To Vacate Suspension Of A General Court-martial Sentence Or Of A Special Court-martial Sentence Including A Bad-conduct Discharge" is a Department of Defense-issued form used by and within the United States Army. 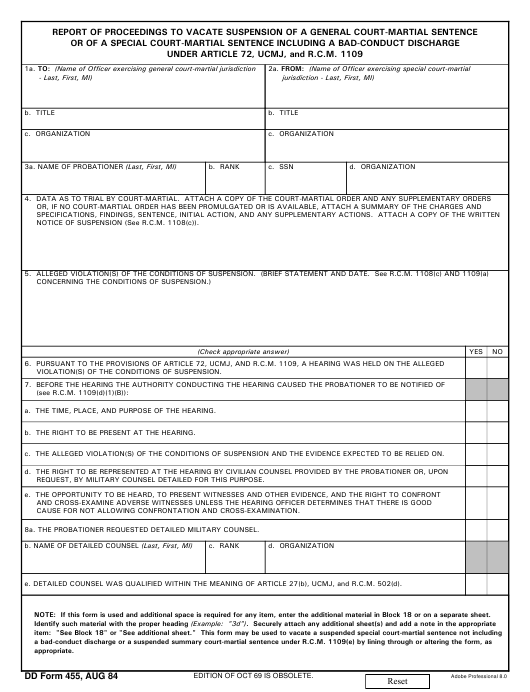 The form - often mistakenly referred to as the DA form 455 - was last revised on August 1, 1984. Download an up-to-date fillable PDF version of the DD 455 down below or find it on the Department of Defense documentation website. NOTICE OF SUSPENSION (See R.C.M. 1108(c)). VIOLATION(S) OF THE CONDITIONS OF SUSPENSION. a. THE TIME, PLACE, AND PURPOSE OF THE HEARING. b. THE RIGHT TO BE PRESENT AT THE HEARING. c. THE ALLEGED VIOLATION(S) OF THE CONDITIONS OF SUSPENSION AND THE EVIDENCE EXPECTED TO BE RELIED ON. REQUEST, BY MILITARY COUNSEL DETAILED FOR THIS PURPOSE. CAUSE FOR NOT ALLOWING CONFRONTATION AND CROSS-EXAMINATION. 8a. THE PROBATIONER REQUESTED DETAILED MILITARY COUNSEL. e. DETAILED COUNSEL WAS QUALIFIED WITHIN THE MEANING OF ARTICLE 27(b), UCMJ, and R.C.M. 502(d). NOTE: If this form is used and additional space is required for any item, enter the additional material in Block 18 or on a separate sheet. EDITION OF OCT 69 IS OBSOLETE. 9a. THE PROBATIONER INDICATED THAT HE/SHE WOULD BE REPRESENTED BY CIVILIAN COUNSEL PROVIDED BY HIM/HER. b. STATE CIRCUMSTANCES AND SPECIFIC PROCEEDING(S) CONDUCTED IN ABSENCE OF COUNSEL. 12a. THE PROBATIONER WAS AFFORDED THE RIGHT TO OBTAIN WITNESSES AND PRODUCE EVIDENCE (see R.C.M. 405(g)). c. THE PROBATIONER WAS AFFORDED THE RIGHT TO CROSS EXAMINE ALL AVAILABLE WITNESSES. THE VACATION PROCEEDING (see R.C.M. 909). b. INDICATE THE GROUNDS FOR SUCH BELIEF AND THE ACTION TAKEN. SUSPENSION AND ORDER HIS/HER RELEASE UNDER R.C.M. 1109(d)(1)(E). 16. RECOMMENDATION OF THE OFFICER EXERCISING SPECIAL COURT-MARTIAL JURISDICTION OVER THE PROBATIONER. b. I RECOMMEND THAT THE PROCEEDINGS TO VACATE SUSPENSION BE DROPPED. 19. DECISION OF THE OFFICER EXERCISING GENERAL COURT-MARTIAL JURISDICTION OVER PROBATIONER.